“Our self-service and app solutions support our vision of providing patron interaction beyond the physical walls of the library,” said Marvin Crisp, President of D-Tech International. D-Tech International is pleased to announce that the Company will be participating in the Public Library Association Show in Philadelphia, PA – March 20-24, 2018. At the show, D-Tech will be debuting its latest self-service solution in the serveIT line, the serveIT-Compac™ RFID Self-check. The desktop kiosk is a fully functional, self-service option, featuring self-checkout, returns, renewals, reservations and many other functions. The desktop serveIT-Compac also engages patrons, providing real-time information on their account and has full digital payments as an option. The desktop units can be positioned at points within the library for patrons to checkout or check-in items via RFID. With its compact design, the units can be easily moved and placed where they are needed within the library or moved for use in other branch locations. 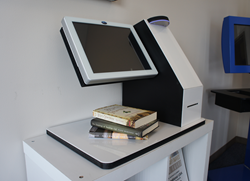 The serveIT-Compac is a viable alternative to full-sized checkout kiosks for library locations with limited floor space. D-Tech will be introducing the appIT Tablet self-service kiosk using android technology self-checkout to reduce costs. The tablet app features an intuitive, easy-to-use interface, new tablet version app self-service kiosk, and staff walk-around mobile tablet with Meet/Greet/Help functionality. D-Tech will also be showing its latest version of appIT for mobile phones. Utilizing either barcode or RFID technology, D-Tech has developed the library app to perform multiple functions that would have been previously performed at the physical location. These features include checkout of items, checking of account status, account payments, renew items, check library locations and hours of operation, chat with a librarian and more. D-Tech will also be showing its DVD, CD Auto Unlock on the Jet™ self-checkout. The Jet™ kiosk is designed to maximize the functionality of self-service while minimizing floor space. Jet’s basic configuration is a self-service kiosk for checkout of barcoded and RFID tagged items. Additionally, D-Tech will be showing its latest version of computeIT™ laptop self-service kiosks with user charger station included. Show attendees can have their mobile devices charged in a secure locker at the D-Tech booth (#1127). computeIT™ is a multi-bay, modular kiosk locker system designed to safely store, charge and dispense laptops, iPads, and MacBooks. Users gain access to the computer assets through an easy to use checkout touch screen interface. “Our self-service and app solutions support our vision of providing patron interaction beyond the physical walls of the library. We are committed to developing and enhancing products that streamline processes inside the library and bring library services to patrons through online and our app developed exclusively for libraries,” said Marvin Crisp, President of D-Tech International. D-Tech International designs, develops and manufactures high-performance RFID products and library security systems. The Company provides installation and customer service for its full range of products. Its technologies include EM, RF, RFIQ and RFID used for self-service, stock control and management, library security, people counting and 24-hour vending. Stop by booth #1127 to find out about D-Tech’s innovative products.